Calligraphy: an exhibition of paintings by artist Gigaemi Kukwits. When I first saw images of Gigaemi’s Calligraphy series of paintings, three things immediately leapt from the canvases into my mind. The first, and the most enduring, was the startling presence of the works. This presence is created through their bold colours, the dynamic relations between the paintings’ elements, and the many layers of lines and colours that give the works perspectival depth. The second was their playful and unmistakeable use of Northwest Coast formline design elements, such as the ovoids and u-forms that were outlined by Bill Holm in his canonical 1965 book Northwest Coast Indian Art: An Analysis of Form. The third was simply: “I’ve never seen Northwest Coast art that looks like this!” They are strikingly original. 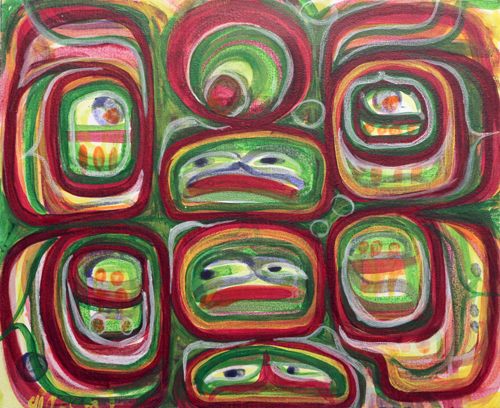 They may reveal and challenge our expectations of what Northwest Coast art looks like. Cultural historian Philip Deloria Jr. (Lakota) discusses expectations in his 2004 text Indians in Unexpected Places. He argues that non-Indigenous peoples in North America (and beyond) hold historically conditioned expectations of North American Indigenous peoples – expectations that confine them to Westerners’ wildly inaccurate notions of Indigenous traditions and histories. These expectations are subtle and culturally ingrained. They accrue slowly through the histories we learn, and the art that we see exhibited. Expectations of Northwest Coast art may be shaped by the “restrictive modern/traditional paradigm” (Duffek and Crosby, 2012) that for decades, shaped Northwest Coast art history, and exhibitions. These embedded expectations manifest in surprise when Northwest Coast art defies our expectations of what it looks like. Gigaemi confounds this modern/traditional paradigm, in his biography and in his art practice. His training combined both ‘traditional’ modes of learning from master artists, and western art school. He first learned Northwest Coast art in his youth, spending time in Mungo Martin, Douglas Cranmer and Mathias Joe’s carving sheds, and learning from them as they worked. 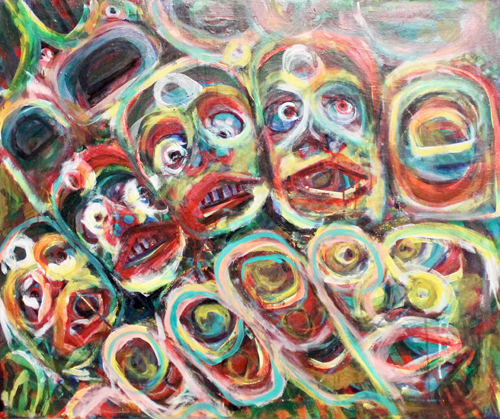 In 1967, he enrolled at the Vancouver School of Art (now the Emily Carr University of Art and Design). Coincidentally, this was the same year Arts of the Raven opened at the Vancouver Art Gallery. This canon-shaping exhibition cemented Northwest Coast art history’s deeply traditionalist bias, resulting in the longstanding exclusion of modern artists from exhibitions and from art history. Although Gigaemi’s paintings are strikingly modern, they are deeply embedded in the artist’s engagement with traditional Northwest Coast formline design. They are also utterly original, and exciting in in this originality, as they play unconventionally with some of the formlines associated with Northwest Coast Indigenous conventions, most notably the iconic ovoid. They are aligned within a trajectory of Northwest Coast abstraction that runs from Douglas Cranmer (Kwakwaka’wakw), perhaps the first Northwest Coast artist to explore the abstract potential of traditional Northwest Coast formline in the 1970s abstracts, through Robert Davidson’s (Haida) highly influential abstract paintings from the mid aughts (see Duffek, 2004), and Yuxweluptun’s abstract ovoid paintings, which he labels ovoidism, and some of Sonny Assu’s pieces, such as his 2013 public art series tag. Unlike Cranmer and Davidson, however, whose abstract formlines always retain the control and precision of the Northwest Coast formline design within their non-abstract, or ‘traditional’ works, Gigaemi’s lines are broad, sweeping and fluid. The colour palette is broad, dynamic and wide-ranging. Gigaemi also innovates in his use of colour. Whereas one of the characteristics of two-dimensional Northwest Coast design has been the use of flat colour fields that interact but do not overlap – for example, areas of flat red lie adjacent to flat black – a characteristic also seen in Yuxweluptun’s ovoid paintings, Gigaemi layers his colours. On some canvases, he applies water to dilute the paint, resulting in translucent layers. Some contemporary artists who have focused on Northwest Coast formline, such as Sonny Assu, have drawn attention to the iconic status of forms, such as ovoids, within BC public culture. 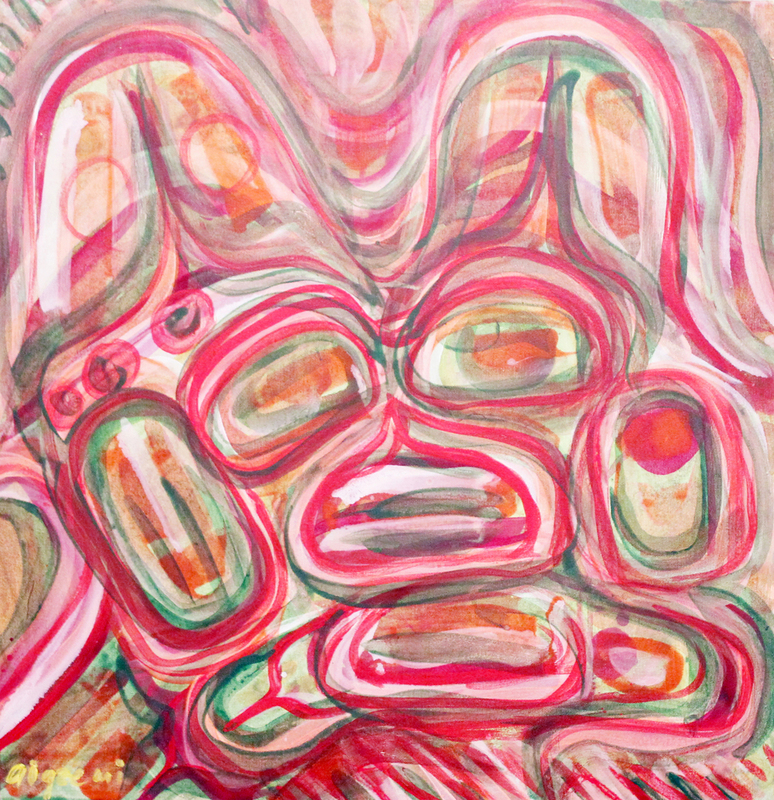 Assu’s work is critical of non Indigenous British Columbians’ superficial appreciation of First Nations art, which is seldom accompanied by a deeper, humbler understanding of First Nations peoples, histories and political issues. Gigaemi’s work painting and layers these forms reveals depth. The title of this series, ‘Calligraphy,’ comes from the process of creating these broad, sweeping formlines. The lines are swiftly painted, like creating calligraphy, he explains, while gesturing the quick strokes of the pen that characterizes that form of highly aestheticized writing. Gigaemi’s use of this term, associated with writing, becomes clearer and more meaningful when he begins to discuss his interests in traditional Northwest Coast art as a system of visual communication. His interests in meaning in traditional Northwest Coast art lie not only in the meaning of the creatures depicted in it – he is interested in the meaningfulness of the forms themselves – the ovoids, the u forms, the split-u forms, and such – as a kind of language. In this sense, they aren’t purely formal or abstract. Gigaemi carefully studies formline on older Northwest Coast pieces, such as the bentwood box design depicted on the front of Bill Holm’s Northwest Coast Indian Art: An Analysis of Form. Like many before him, perhaps most prominently Wilson Duff, Gigaemi is captivated by what the particular configuration of formline elements is intended to communicate. Gigaemi’s description of the swift process of painting these works, one where the precise placement of the formal elements is not carefully designed, calls to mind Yuxweluptun’s approach to his ovoidism paintings. According to Ritchie, Yuxweluptun’s approach to painting these particular works is “purely intuitive, often without preliminary design.” Yuxweluptun elaborates: “There is an intellectual process of balance, design, colour, that comes out of just being.” Yuxweluptun, and I would argue, Gigaemi’s paintings emerge from the painter’s rich experience of the formal elements, as a way of seeing and understanding the world. They are about their presence. British Columbia Museum of Anthropology. Duffek, Karen and Crosby, Marcia. 2012. 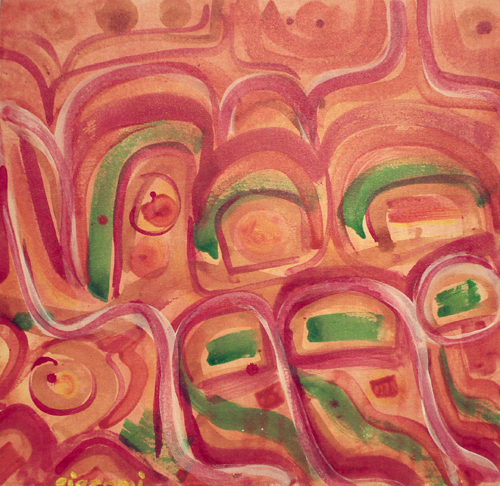 Projections: The Paintings of Henry Speck, Udzi'stalis. Alice Campbell is an independent writer and educator who has previously taught Indigenous Art History at UBC and Emily Carr University. Her interests include the history of Northwest Coast art exhibitions, land- and place-based art practices, and the ever-changing role of Northwest Coast art and images – both monumental and ephemeral – in Vancouver public culture.